Big shout out to Ed Stiles and his awesome box joint jig. I need organization and storage space in the little corner of my 1-car garage I call my ‘shop’. So there are a lot of drawers in my future. 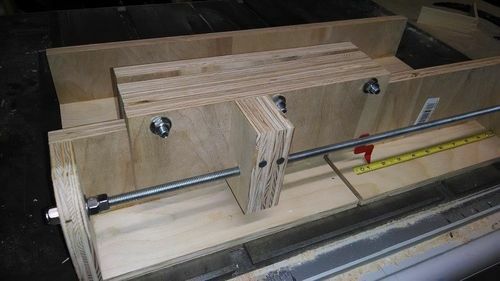 Figured I needed a jig and after research – Ed nailed it. His video easily convinced me his jig was what I wanted. As I’m just getting started again, this was the hardest (most complex) thing I’ve built yet. With all the cutting and hardware, it was not a weekend project for me: took me 2 weekends and some night in-between (gluing, etc.). But I wanted to get it right. It is awesome!!! 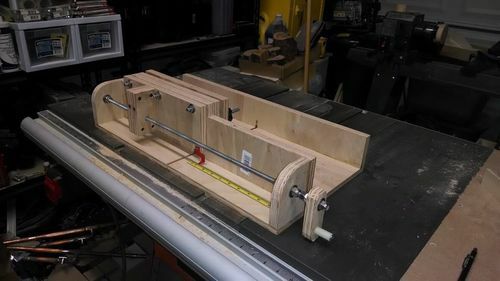 However, one HUGE caveat – and Ed made this clear – you need a 1/8” kerf or 1/4” kerf. Thought I did. After screwing up a LOT of scrap thinking I was counting wrong or positioning wrong – I did some deep dive troubleshooting step-by-step. Turns out I had a 3/32” kerf blade. Try cutting fingers in multiples of 1/8” with a 1/16” threaded rod with a 3/32” blade. I dare you. If you can, you’re up there with Sir Isaac Newton in my book, ‘cause you’ll need calculus and the quadratic equation to come close. 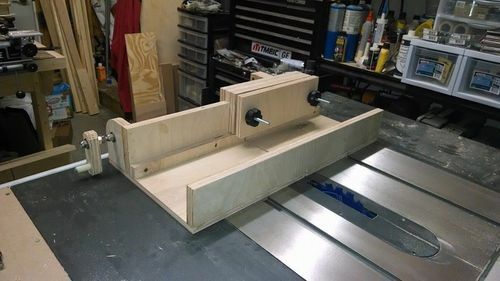 nice box joint jig. I just finished mine based on Ed’s idea(with a few variations) but I agree it was a bit of work and hair pulling. your looks good. Nice jig. Can you use a 1/32 shim for a second cut to make the 1/8”. They it will be two turns!! Very nice! I built one based on Ed’s design a month ago. Wow – beautifully done. Interesting mod where you put your tape measure on the bottom and hung a gauge down to it. Always interesting to see the different ways to skin a cat. I had a roll of tape measure tape – like masking tape with a tape measure. Each length goes up to 96” and then starts over until the roll runs out. Don’t know where I got it or why – probably just thought it was ‘fun’ looking masking tape. I just pulled some off and stuck it down with clear packing tape over top as a protector. Your mod is pretty cool. I see no clacker on yours. I really like Ed’s clacker opposite the handle. It rocks. Nice job on yours. As for the clacker, I honestly didn’t have the parts on hand to add that, so I just use the handle pointing straight down as my index point. So far, that is working. I was right in the middle (still am) of building my shop when I built this, so I actually only cut a few test joints and have yet to make an actual project. I just bought the Freud box joint dado blade set, so I need to break that out and try the jig with it.